Remy Maisel, a GoodGym runner tells her story of how being part of Nesta’s Accelerating Idea grantee GoodGym has enabled her and others to feel less lonely and more connected with their community. Remy Maisel is a nonfiction author and avid runner. Originally from New York, she now lives in London and is a member of GoodGym. 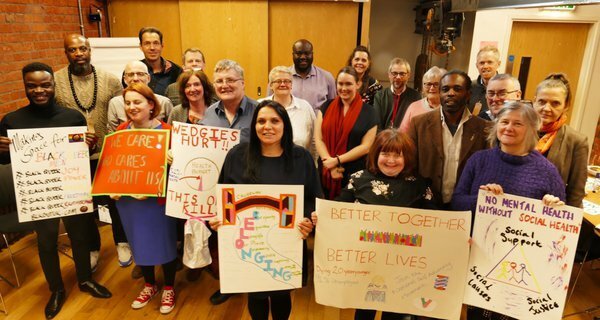 In the past few weeks the BBC released the outcomes of their Loneliness Experiment, the largest study of loneliness yet, and the Government published its first ever strategy for tackling loneliness. The take-home message from both is very clear: loneliness is everywhere. It is affecting people regardless of age or background and is as great a public health challenge as smoking or obesity. There is also the realisation that more needs to be done to support us to build meaningful connections and restore social contact in our lives. As a GoodGym member, I’m frequently congratulated by others when they hear about my involvement with this community of runners that combines doing good and getting fit. ‘What a good girl you are’, my new neighbour said when I explained what my red t-shirt was for and why I was going out to run even though it was already quite chilly and dark for early autumn. This always makes me - and, I know, many of my fellow runners - a little uncomfortable, because even though it would be easy to spin running to help a local charity or isolated older person perform practical tasks as saintly altruism, those of us who have experienced GoodGym know we’re getting just as much out of it as the people we visit. Runners can do group runs during the week, visiting local charities and helping with community projects, run to do one-off practical tasks to help older people live safely in their homes, or be paired up with an older person for regular social visits. 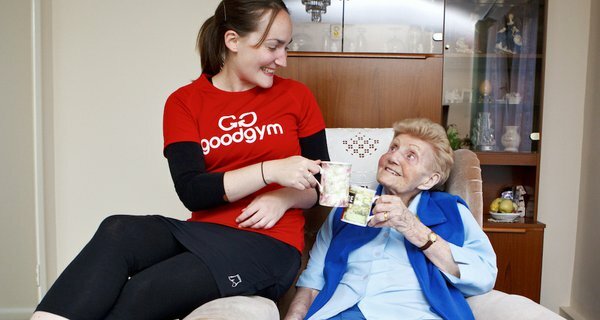 With this third option, runners are paired with an older person - called a ‘coach’ because they motivate the GoodGym runner to exercise regularly - whom they visit weekly. So why do we do this? Although many coaches don’t necessarily identify with their title, the runners definitely do. The motivation for GoodGym runners to exercise regularly is real, with the runners knowing that someone is waiting for them at the other end. Some people even start out doing coach runs, and end up doing things they never thought possible - like running half marathons. The runners are learning new things and connecting with a different generation. Six months after joining GoodGym, members experienced weekly increases in physical activity. Runners make a meaningful connection with where they live by becoming involved in community projects. Nicky, a GoodGym runner who has been visiting Coach Delia in Kingston for a couple of months, is proof that the benefits are not just physical. She says that when she returns home from runs to Delia, her husband can tell that she’s been to see her, because of her good mood. Why the coaches might benefit is more clear, but the evidence still bears repeating: loneliness is particularly an issue for older people, with Age UK reporting that 1.9 million older people in the UK ‘often feel ignored or invisible’. The leader of Britain’s GPs said loneliness is as dangerous as long-term illness like diabetes. Those experiencing loneliness are 50% more likely to die prematurely than those who are not. Various initiatives exist to combat loneliness, including government and businesses, but research from the Red Cross finds that people consider the support ‘piecemeal and fragmented’. The connections are not being made on the older people’s terms, or satisfying the need for ‘meaningful and satisfying social connections’. It is clear that there is still room for innovation when it comes to this issue. According to an evaluation conducted by Ecorys, visits from runners had a positive impact on the social isolation of their coaches, with all coaches reporting feeling happier and 98% considering the runners their friend. Coaches also report higher life satisfaction after six months of visits from a GoodGym runner, with increases from a baseline of an average of 4.78 to 6.11. I think GoodGym works because the connections runners and coaches are making are real. This is basically because we as runners and they as coaches want the same thing out of it: a meaningful connection. They’re happy to have me there, and I’m happy to be there. Nobody is immune to loneliness. I’m a few decades younger than the people we visit, but I emigrated to London from New York alone three years ago to do a postgraduate degree. Even though that was the right decision for me, it was sometimes terrifying and - yes - lonely. GoodGym made it possible for me to put down roots in London and feel connected to my community. I can’t imagine living anywhere else. Interested in learning more about GoodGym? 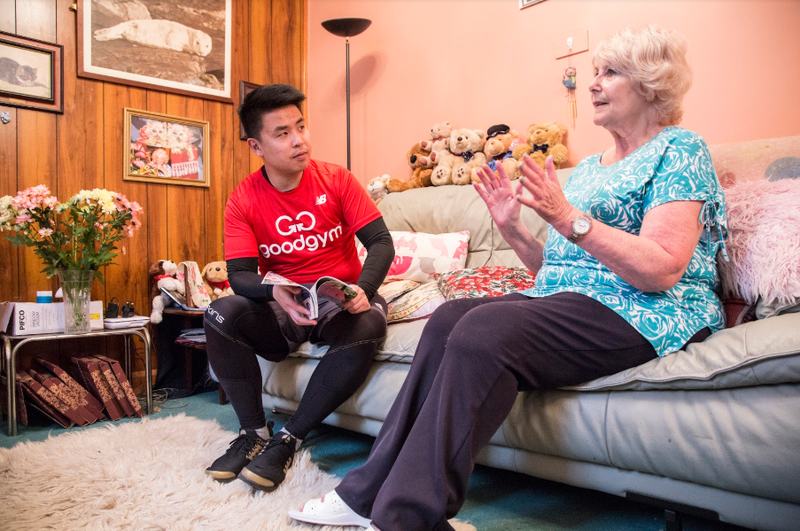 You can find a group run, learn more about missions and coach runs, or refer an older person to receive support on the GoodGym website. Our thoughts on the Government's new loneliness strategy and the areas we feel will have the greatest impact.